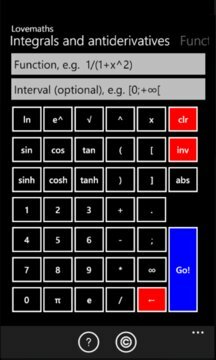 The application Lovemaths is performing analysis of mathematical functions and calculation of integrals and antiderivatives. For function analysis, the function, e.g. ln(3x^2-1), has to be specified in the first text box, by using for example the keyboard of the application. A study interval can also optionally be given (e.g. [3;+∞[). By then clicking on "Go! ", the analysis is performed (domain of definition, derivative, limits, asymptotes equations, table of variation, graph). The result is a PDF file. An internet access is required. In case a bad function or interval is entered or if a problem occurs while trying to connect to the internet, a descriptive error message is displayed. For integrals calculation, a function has to be specified in the first text box. The lower and upper bounds of the integral have to be given in the second text box as an interval (e.g. [3;+∞[). If no interval is specified at the time the "Go!" 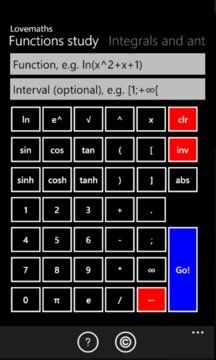 button is pressed, antiderivative is calculated. As for function study, result is a PDF file. An internet access is required. In case a bad function or interval is entered or if a problem occurs while trying to connect to the internet, a descriptive error message is displayed.